The innovation of schools inevitably goes through a new way of teaching that involves the adoption of technologies inside and outside the classroom and the experimentation of interdisciplinary collaborations. In this context, it is crucial for digital schools to be efficiently connected and with a bandwidth capacity that is proportionate to the daily needs of students and teachers. Schools are one of the most widely distributed institutions on the territory and, especially in some geographic areas, the absence of broadband connectivity adds to the already existing digital divide. GARR, the Italian national research and education network, promotes the spread of ultra-wide bandwidth connections among schools to foster digital innovation processes in teaching and the achievement of the goals listed in the Digital Education Agenda. High-performance connectivity and advanced services are for schools a true digital highway that offers the same technological opportunities available in the research and university sector, thus helping in building a bridge among these three sectors. Schools thus enter a wide and multidisciplinary community, which is not limited to the national level but has a wider horizon thanks to the interconnection of GARR network with other global research networks and the general Internet. All GARR network links have a high and symmetric bandwidth, that means with the same speed in both download and upload. This feature is generally little known and it is not available in the commercial offering and it is of crucial importance for teaching as it enables schools to create content, services and applications, thus becoming and active rather than a passive network user. 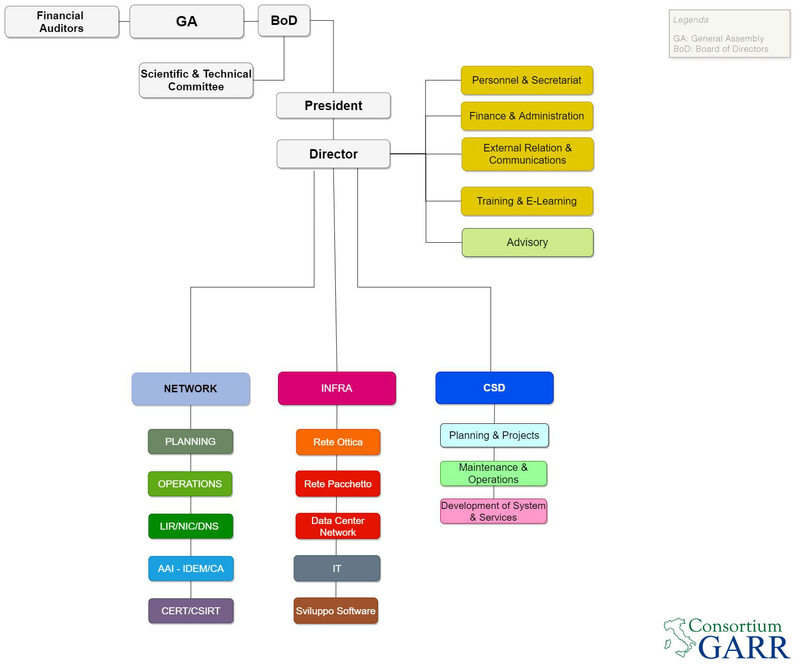 Once connected to GARR network, schools become part of an interdisciplinary community that gathers university and research and perceives the network as an indispensable element to foster collaboration, the sharing of knowledge and skills, to enrich the educational experience and to facilitate education and professional guidance activities. In addition to the benefits of a transparent and high-quality network, users can benefit of a wide range of services ranging from network management and maintenance, IT security, web domain management, public addressing, management of digital identities, multi-video conference, wi-fi on the move. The vision of connected schools is shared among many European countries, and in several cases, local national research and education networks are already interconnecting schools with their backbones. In some cases, in addition to connectivity, research networks provide schools with application services such as video conferencing, e-learning and e-collaboration tools, digital library access and online contents. The most notable example at the European level is represented by the United Kingdom, with nearly 25,000 connected schools. Other important examples are Greece, where, since 2004, all schools are connected thanks to a project for regional development co-funded by the EU, and Ireland, whose first broadband project for schools dates back to 2005 and is currently engaged in a major upgrade of its infrastructure. In recent years, GARR has focused its activity on the provision of high-performance connectivity also to schools. To date there are hundreds of institutes connected to the network, and thousands of students and teachers can benefit every day of this digital highway and play an active role in the network by creating content and collaborating, having the same opportunities of researchers all over the world. Schools are connected in a variety of ways, applying the same principles to all GARR entities: using, whenever possible, optical fibre with a minimum 100 Mbps of symmetric bandwidth. In some cases, schools are connected through regional, metropolitan or campus networks already present on the territory, in collaboration with local authorities and universities. In Southern Italy, where the digital divide is particularly evident, GARR contributed in connecting higher education schools to its optical fibre network with GARR-X Progress, a project funded by the Ministry of Education and focused on the Regions of Convergence (Sicily, Campania, Apulia and Calabria). GARR-X Progress, which was concluded in 2016, was a great opportunity for local schools but also a fundamental investment to foster the digital innovation process in teaching activities. A digital highway connecting Italian universities around the world and services to facilitate the mobility of students, researchers and teachers. A digital infrastructure for biomedical science excellence: high speed network to access archives and services safely. Digital archives and innovative services for the study, conservation and sharing of Italian cultural heritage. Fiber optic connections and advanced technology for a step-by-step teaching. Advanced audio and video solutions and fiber optic connections to bring music and art over time and space.